Baffle your audience with your insight into Norway trivia. Here are 20 ice-breakers to get the conversation started. The length of the Norwegian coastline is 2nd only to Canada. Even most Norwegians don’t know that parts of Northern Norway is further East than Istanbul. Or that more Norwegians than Canadians speak English. Armed with these 20 fun facts about Norway, you are ready to engage the domestic audience with your insight. Norwegians tend to be viewed as a bit introvert. But we aren’t, really. We’re just being polite by not disturbing you in any way, or wasting your precious time. A bit like the Finns. Until we’re partying, that is. In any case, these are good ice-breakers to get Norwegians to talk about other things than the weather. Good luck! It’s still a couple of months until we depart for this summer’s great gravel road expedition, and I need to lose some weight. Off the gear. Here are 6 weight-shedding items. 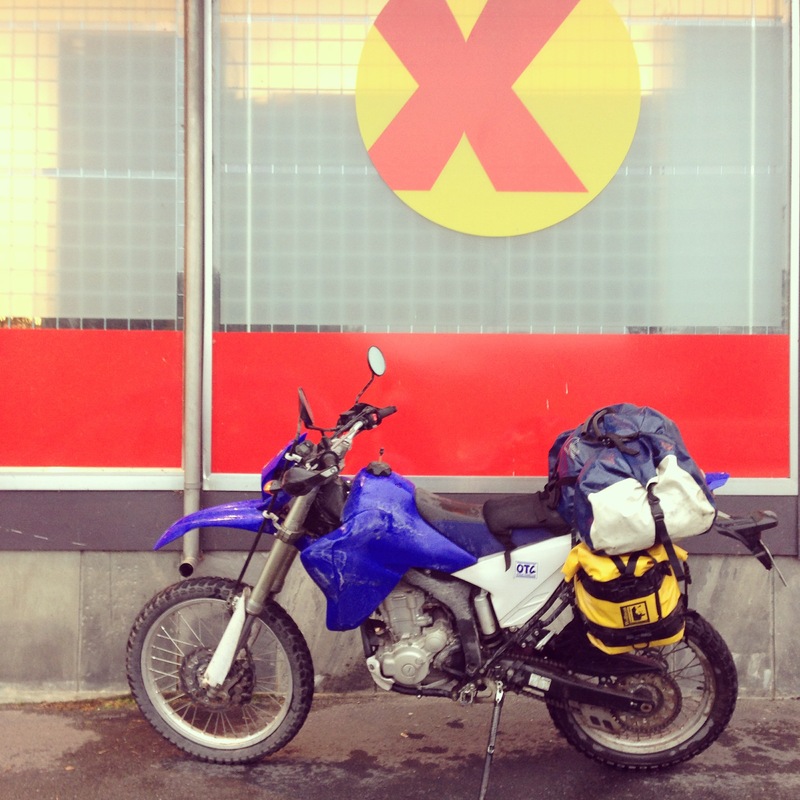 Aiming at max camping comfort, I packed my WR250R way too heavy for gravel riding on my test trip. Now it’s time to lose some weight! A couple of weekends ago, a buddy of mine and I went for a weekend gravel trip into the Forest of the Finns near the Swedish border. This was some sort of a shakedown trip, as I packed the bike as I thought I would for the upcoming gravel expedition from South to North of Norway, paying special attention to bring along stuff that would make the nightly stay-overs more comfortable. You know – a bed AND a mattress, a big roomy lavvo, fat sleeping bag, et cetera. Heavy, but comfortable and cozy. Ingenious design on this table. 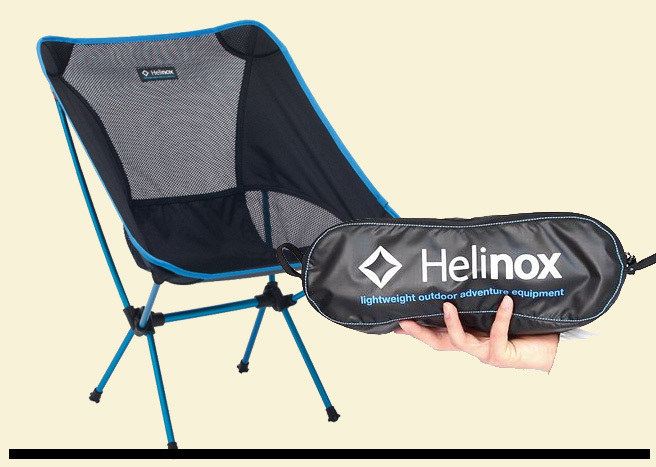 The incredibly light and small-packed Helinox chair. And it actually works! Not particularly surprising, this focus on comfort also meant that the bike behaved like a pig on the loose surfaced and quite muddy gravel roads. It became far too heavy overall, and particularly in the rear. I could not imagine a ride like that for some 5000 kms return. So I need to lose some weight. Off the gear I’ll bring. A down McKinley sleeping bag. 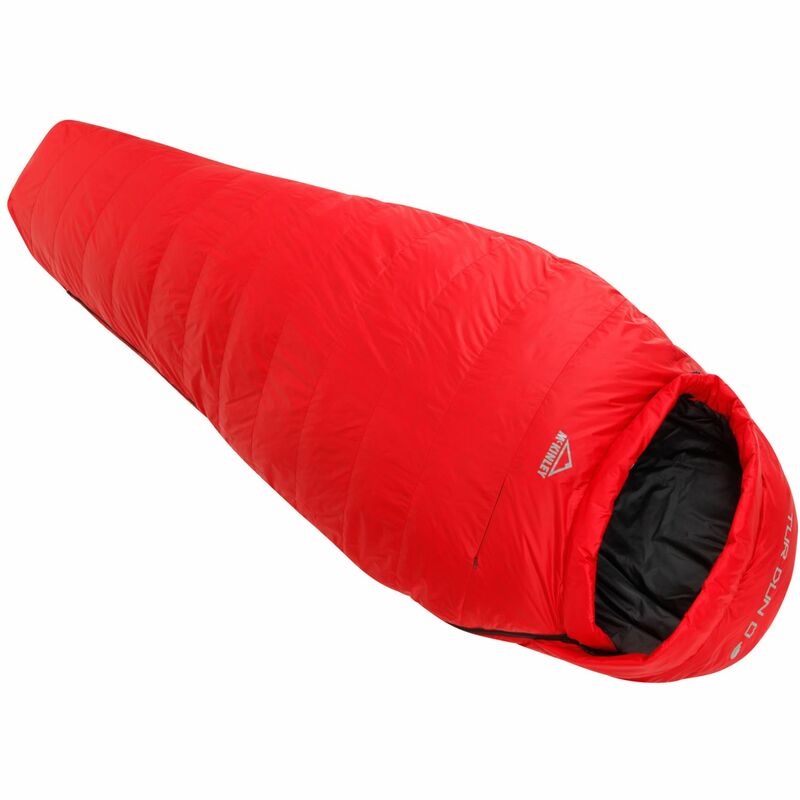 Being stuffed with down (90%) and feather (10%), it is light (1 kg), packs really small, have a decent rating of 0C, and is – above all – on sale for half price at the local outdoor gear store. McKinley Enduro Ultralight tent. Weighing in at 1.3 kgs, it’s very light and not very expensive. The downside is that it’s only a single sheet tent, so it’ll probably not be 100% dry in case of heavy rain, which is why I’ll also bring along a tarp. Dovrefjell Tarp 4. 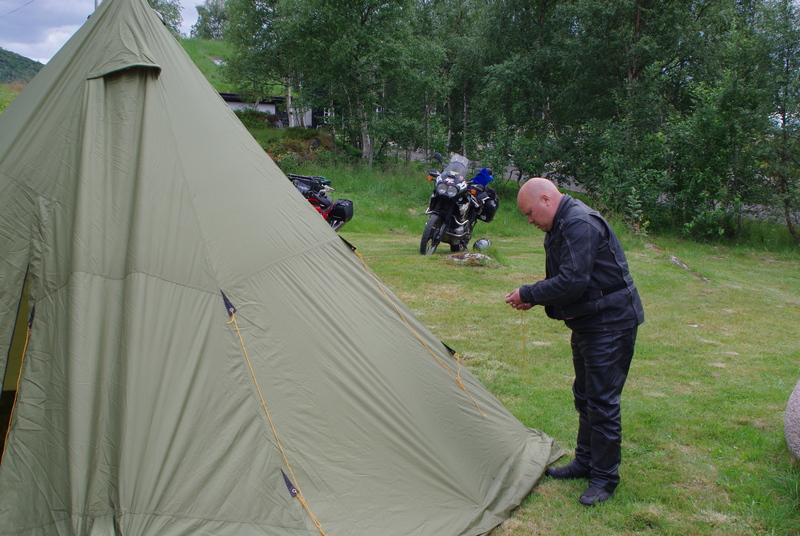 This 3×4 m tarp is very light, packs very small, and provides extra shelter in case of foul weather. Exped Downmat 9 sleeping mattress. It packs quite small, and provides all the sleeping comfort I’ll ever need. 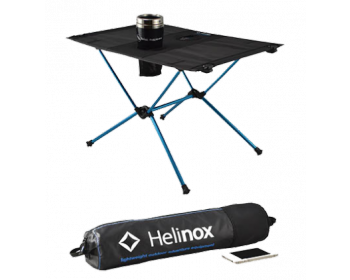 Helinox chair and table. These collapsible camp furniture are extremely light and also packs unbelievably small. I’ve tried them in the field, and they really work! They’re a bit on the pricey side, though, but lightness costs. I haven’t checked the total weight yet, but I’ll think it’ll be around 6 kgs, which seems quite good. Now all I have to do in addition is to bring lightweight food, cooking gear and clothes. Oh, and let me know if you have any tips on lightweight gear! It was way past due to grind those off-road tyres on proper gravel roads. Last weekend, Henning and I decided to do just that. We spent the night in one of the cabins which are available for free or nearly free. Peaceful and nice! I am quite a newbie to proper gravel riding, even though I´ve been facinated by it since many years. Not until I bought my light, nimble and powerful-enough Yamaha WR250R did I dare to venture into the loose stuff for real. 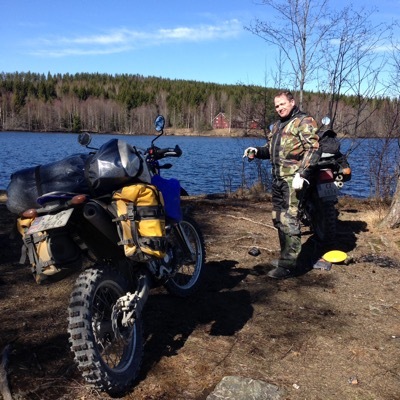 Henning, on the other hand, is a former motorcross, road race and enduro rider and instructor. Thanks to him, my learning curve has been pretty steep – although this particular weekend I felt like it was my first time on gravel: My riding was stiff, my cornering awful, and things just didn´t feel right. 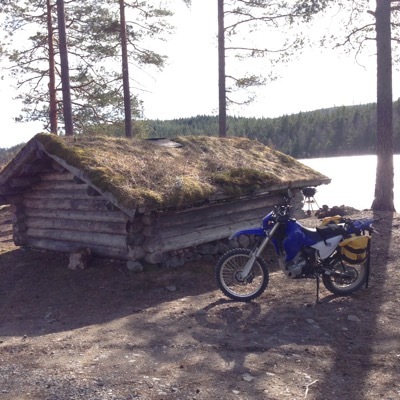 However, the area in which we were riding, Finnskogen (eng. “Forest of the Finns”), is extremely inviting when it comes to gravel riding. There are miles and miles of gravel roads, very little (if at all) traffic, and free cabins all over the place, which you can borrow for the night. In other words: A Mecca for gravel riders. 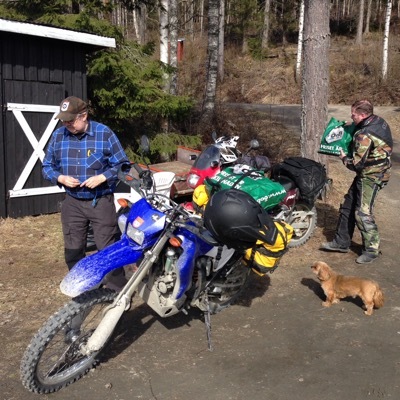 The first leg was all but muddy: The track was thick of slippery mud, so we admittedly had to struggle a bit to get our bikes through – Henning on his Transalp, me on my Yamma. Or at least: It felt like we had to struggle. I think I was the only one who did it, as Henning effortlessly steered his Honda more or less sure-footed through the slippery stuff. It did become a lot better when we arrived to the forest roads themselves: Dry to the point of dusty, vacant and available. We spent a night in a small cabin, had a meal and just relaxed before riding back home the day after. A short burst of season debut for me, but it was good to shake loose a bit. I´ll even try to do better next time. 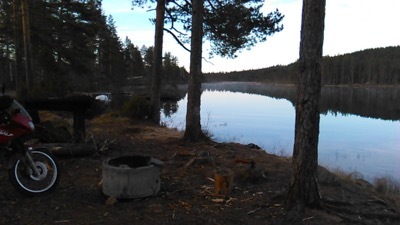 If you´re a gravel rider too, make sure you visit Finnskogen when you visit Norway. It´s well worth spending a few days on this area. Henning (right) and yours truly. 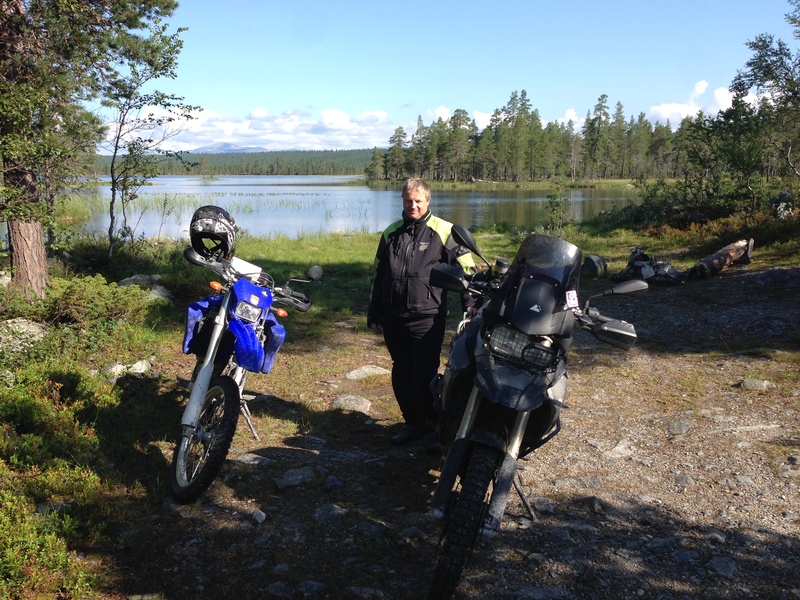 We´re heading for Kirkenes in the north by gravel this summer. There was no firewood in the cabin, but Rolf, who lives nearby, provided us with a couple of bags to heat the evening. Beside your bike, riding gear, passport and credit card, there are a few things that makes out the mainstay of every riders touring set-up. These are the 9 things I can’t do without. A lavvo is the ultimate compromise between enough living space and pack size. A mainstay in my touring set-up. So you want to ride to the top of Europe? Nordkapp isn’t it – but you can still reach it. The classic Nordkapp picture. But you are not on top of mainland Europe when you’re standing by the Globe. After many adventurous miles on your motorcycle, you finally reach your goal. 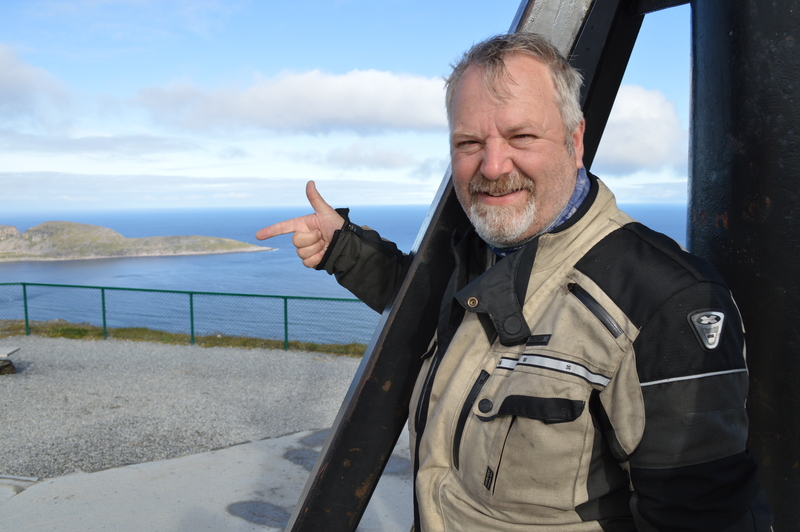 The North Cape – Nordkapp. You park your bike and wander along the path leading to the plateau and ask a fellow tourist to take a picture of you beside the famous Globe. You are on top of the world. On top of mainland Europe. Only – you aren’t. Contrary to popular belief, Nordkapp is not the northernmost point in Europe. Some argue that the fact that Nordkapp is situated on the Magerøya Island in itself disqualifies it from being the northernmost point on mainland Europe. But for some reason, Nordkapp has gotten away with it, especially after they built the under sea tunnel connecting the mainland and Magerøya Island. Heavy marketing has also led most people to accept that the Nordkapp plateau IS the northernmost point. But even if we accept that Magerøya is a part of the mainland, Nordkapp (N 71° 10’ 21”) is still not farthest to the north. Actually, it is Knivskjelodden (N 71° 11’ 08”). Knivskjelodden is a small peninsula west-northwest of the Nordkapp plateau. It is nearly 1.500 meters further north than the plateau itself, and you can see it when you stand by the Globe. The good thing is that Knivskjelodden is reachable – but you’ll have to walk there. Some 7 kms south of the plateau,along the main road, you will find the starting point of a marked walking path leading to Knivskjelodden. The path is 8 kms long and will take you some 2 hrs to walk. It might seem like quite an ordeal, but hey – how often are you on the real Top of Europe? 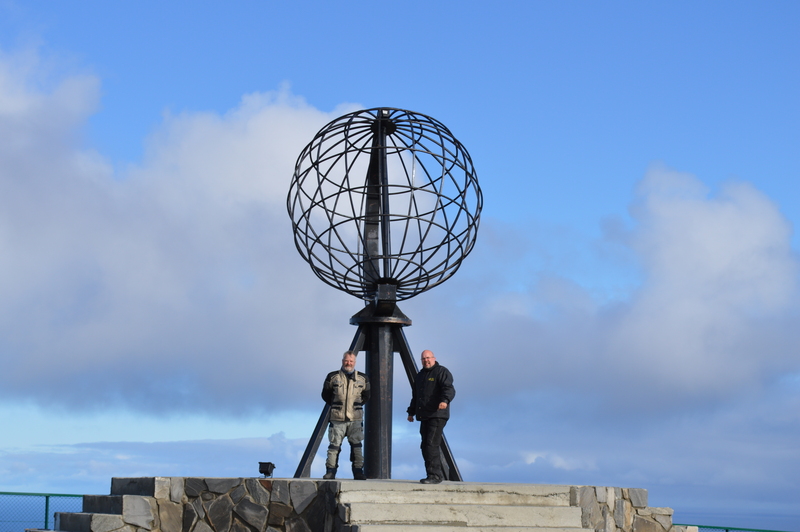 Standing by the Nordkapp globe, Jon is pointing at Knivskjelodden, where he actually has been. 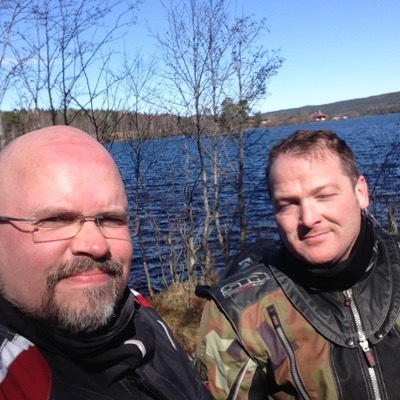 Our biannual motorcycle fair is a big thing for riders in Norway. It’s drooling time! A not so new bike on display at the M/C Fair. Still droolable, though. It is estimated that there are some 130.000 riders in this country. Not so many compared to – say – Italy, but enough to fill the biannual fair. Besides a few small, local shows, this is actually the only motorcycle fair to be reckoned with here. It’s hard not to be tempted by all the sweet bikes that are on display, even though I must confess I have a soft spot for older bikes. 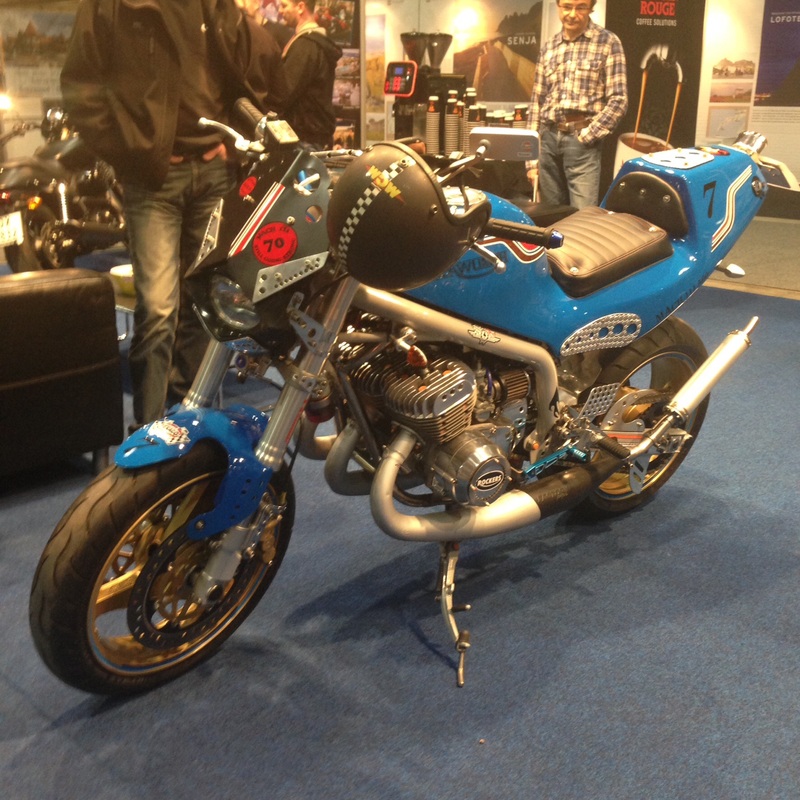 At the Guzzi club stand, for instance, I saw this 250 Airone with the classic Guzzi design. The Road Administration touted their National Tourist Roads project at the M/C Fair. 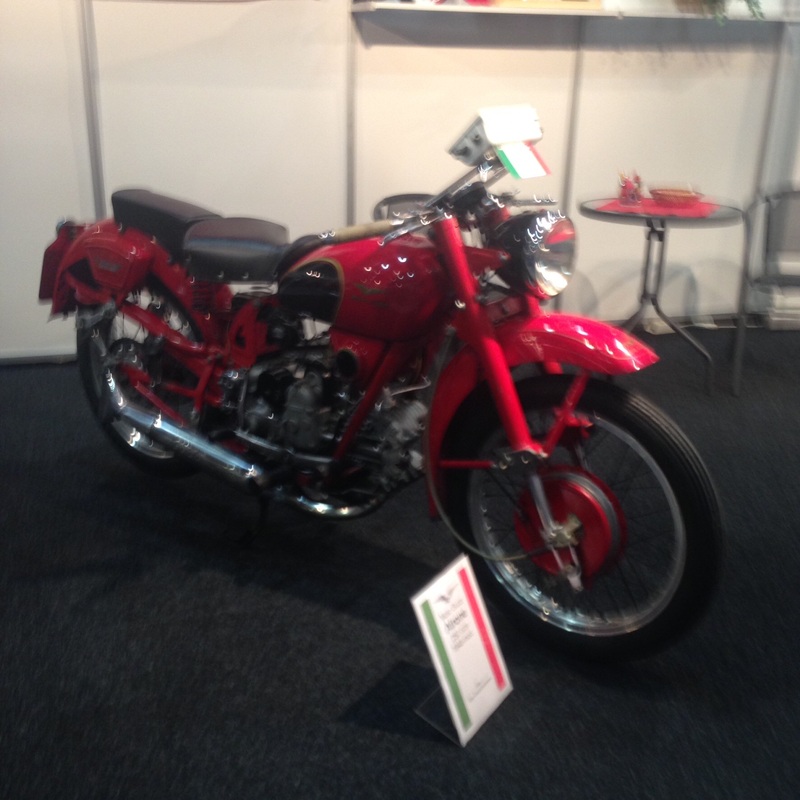 A sweet Moto Guzzi 250 Airone at the Guzzi Club´s stand. 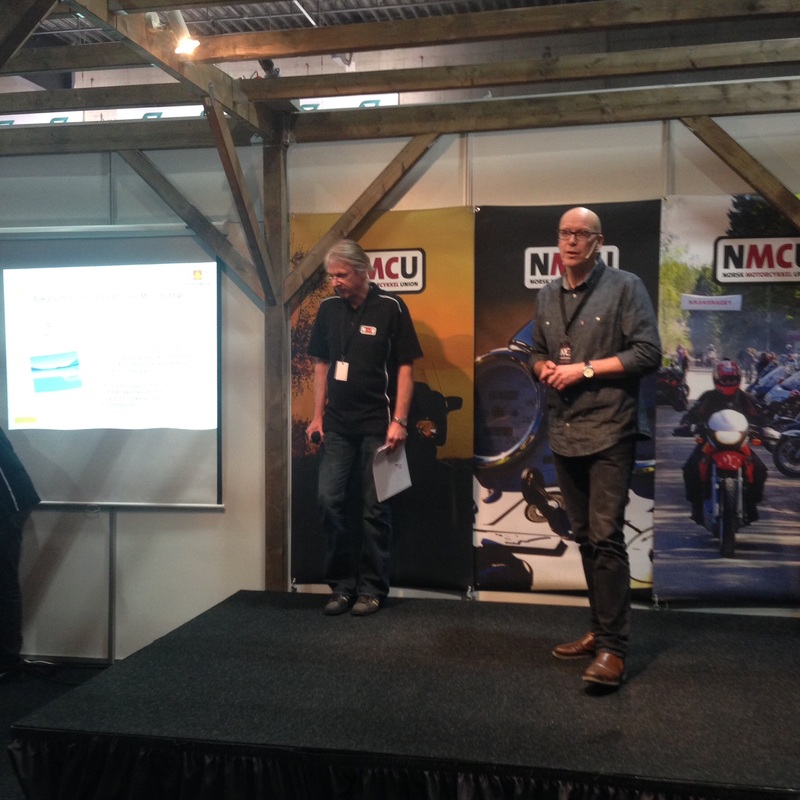 In cooperation with the Norwegian Motorcyclists´ Union (NMCU) the Road Administration presented a brand new strategy for motorcycle strategy in Norway. Good also for you who will visit us. For the first time I also spotted the Road Administration’s booth where they touted the National Tourist Road project. They have realized the obvious that those particular roads are extremely well suited for motorcycle travel. Check out this link for more insight. On a more political note, the Road Administration presented their brand new Motorcycle Strategy, which includes 21 concrete actions for improving the safety of motorcyclists in this country. 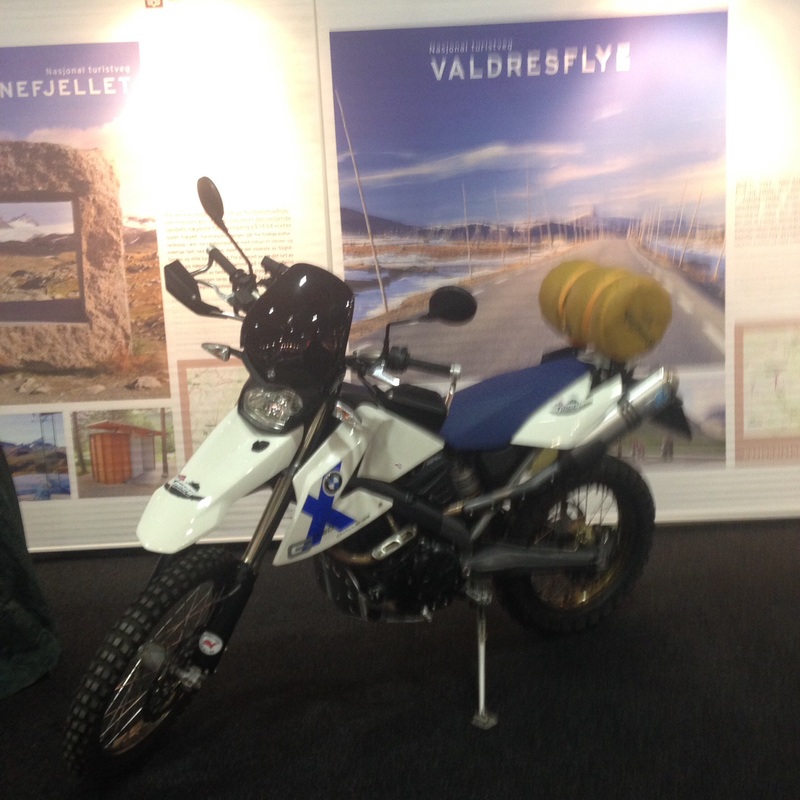 The Norwegian Motorcyclists Union, which played a key role in the making of the strategy, had a stand from where it was presented to a huge audience. Norway is already the safest country to ride a motorcycle in, according to statistics from the European Motorcycle Safety Council. With this strategy, it will be even safer. Good thing! 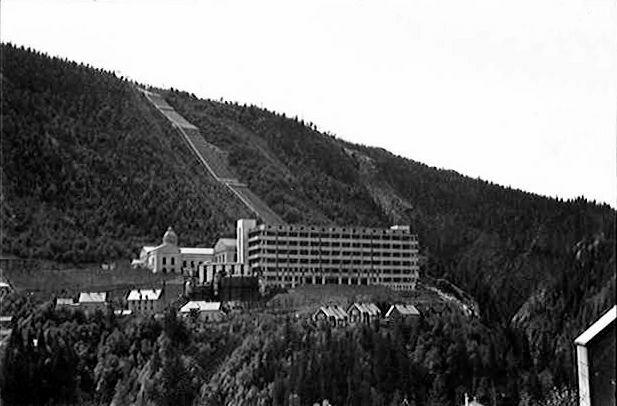 One of WW2’s most famous sabotage actions was against the heavy water plant in Vemork, Telemark. You can – and should – visit the plant on your motorcycle trip. 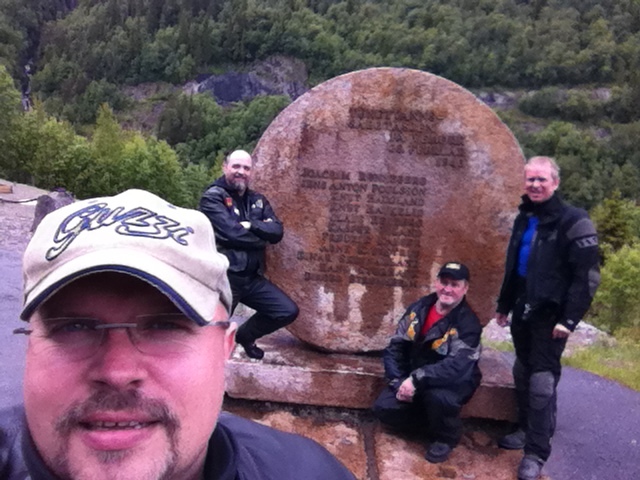 Yours truly selfie with Håkon, Asle and Geir-Olaf by the sabotage memorial monument. The Norwegian telly broadcaster NRK recently aired a highly popular series depicting the quite astonishing sabotage mission against the Vemork Heavy Water plant in 1943. Dare-devil Norwegian commandos, trained by British SOE, managed to get into the plant and detonate explosives – without casualties – to stop Hitler from getting his A-bomb, for which he thought he needed heavy water, or deuterium oxide. When you get there, you realize what a stunning feat this was, as the plant is on the other side of a deep, steep canyon – and especially since earlier failed sabotage missions had led the Germans to strengthen the security and placing some 3000 troops in and near the facility. SOE later reckoned this mission to be its most successful during WW2. You can have a guided tour at the plant, and get an insight to the many sabotage actions that were launched against this plant during WW2. Check out this fly-over video of the Atlantic Road! What is your favorite road in Norway? The Atlantic Road should be on anyone’s bucket list. I am extremely fascinated by the Atlantic Road. It is one of the most wonderful pieces of road in this country – and that says a lot! This 8274 meter long road connects Eide with my favorite place in these parts of Norway, Averøy Island. It was opened in 1989, and is one of the most visited places in this country. The road comprises of no less than 8 bridges, making the road seem like it’s “jumping” between the small islands on which it run. The tallest bridge, Storseisundbrua, is at 260 meters. The UK newspaper The Guardian even ranked the Atlantic Road on top of its list of the best road trips in the world. Actually, the whole road from Kristiansund, through the undersea tunnel to Averøy, across the island and the Atlantic Road, further onwards along the Hustadvika to Bud is one fantastic motorcycle trip in itself. Make sure you visit it when you come here! If you already have a favorite road in Norway – which is it? For riding in Norway, practically any bike size will do. Actually, a too big one will probably be more restrictive than a smaller one. 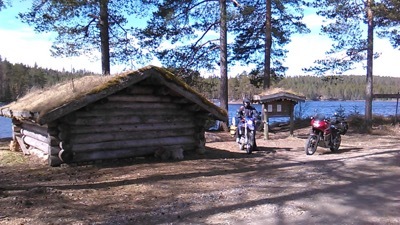 Choosing a smaller capacity, light bike makes it easier to venture to the secluded, nice places in the forest, for example. 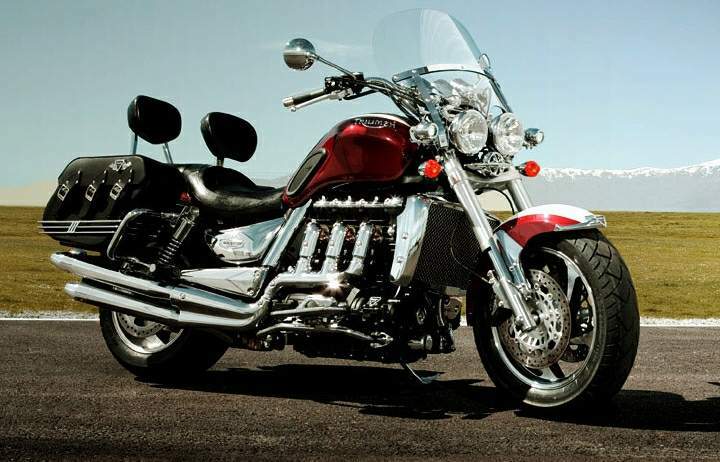 Of course you’ll have fun on your Triumph Rocket III. Even – to a certain degree – on your Boss Hoss, if that’s what you have, even though you might struggle in the tightest bends of the Lysebotn serpentines. I have toured extensively on several bikes, mainly Guzzis from 750 ccm upwards to my California 1400. 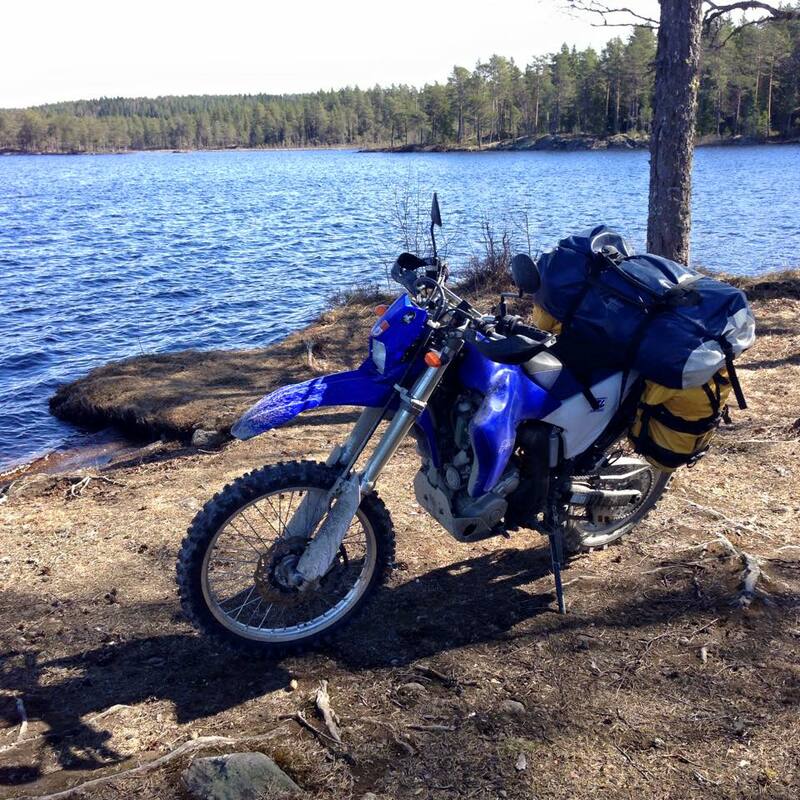 I must admit, though, that in the last year or two I have toured more and more on my small capacity Yamaha WR250R. It’s more than adequate for the low speed, narrow Norwegian back roads, where you should spend most of your time anyway, while still being able to do highways (which are a max of 110 km/h anyway) without being stressed. Why, my daughter and I have even toured on a couple of pizza delivery mopeds. We didn’t venture too far on those, but it is still doable. There are not that many long, boring highways in Norway. Except for the southern parts of the E6 and E18, and a few stretches around Trondheim, Stavanger and Bergen, the roads are usually quite small enough to be capable of catering for 125 ccm bikes too. Which means that if you have a learner youngster at home who wants to tag along, or you are a learner yourself: Do not that let it prevent you from coming over. It’s the mindset that counts – not the tool, right? My current favorite touring machine, a Yamaha WR250R, fitted with an extra large tank for extended range and a pannier rack for soft bags.